Looking through a catalogue of Penticton, B.C.-based Structurlam’s past projects is like flipping through an interior design magazine. Large, often curved glue-laminated (glulam) timbers grace stately interiors while the cross-laminated timber (CLT) panels blend in as floors, ceilings and walls. It’s easy to see why developers would choose wood as a naturally beautiful building material. Structurlam – North America’s first manufacturer of CLT – knows it’s about much more than that. Mass timber, they say, is a smarter way to build, and they are ramping up production to meet the growing demand. This year the B.C. company expanded yet again by adding another manufacturing facility, increasing their capacity by one third. Mass timber is defined as large prefabricated engineered wood building products comprising glulam, CLT, dowel-laminated timber, laminated veneer lumber, and nail-laminated timber. An expanding body of research shows, when compared to concrete or steel, mass timber products are lighter, cheaper, easier to construct, react better during fire events, and are significantly more environmentally friendly. All this adds up to a better building material. But, as with any disruption to the marketplace, mass timber will take time to adopt, explains Structurlam CEO Hardy Wentzel. But he thinks it’s happening faster than usual. “It’s a massive, exciting opportunity. In my career I’ve actually seen developers put weight on the importance of sustainability and environment. Consumers are driving this growing demand,” Wentzel says. Structurlam’s origins date back to 1962 when local Okanagan construction company Greyback ventured into the world of glulam beams. They started up a head office and manufacturing wing in Penticton, B.C. Adera Group purchased Structurlam in 2007 and built the company’s first Okanagan Falls manufacturing facility, tripling its glulam capacity. In 2011, with funding support from the provincial government, Structurlam opened North America’s first CLT plant and began manufacturing its trademark Crosslam CLT. 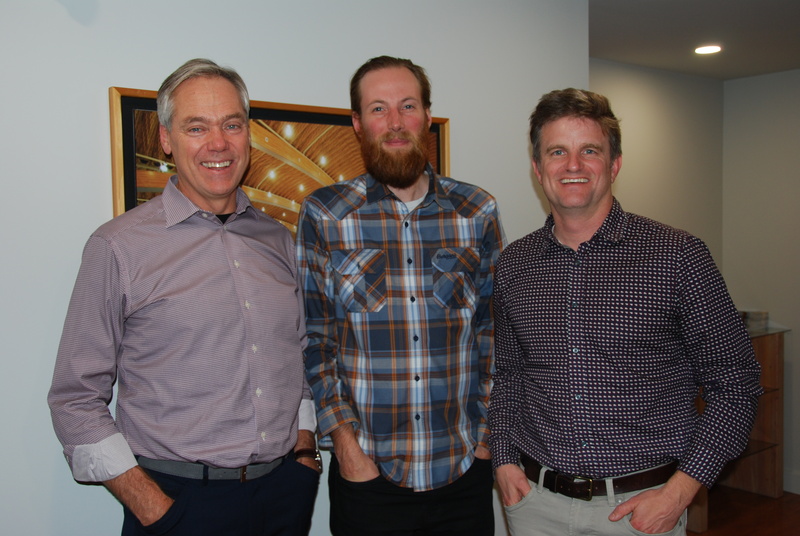 From left, Structurlam CEO Hardy Wentzel, Nicholas Sills, mass timber design manager, and Stephen Tolnai, vice-president of sales and marketing, at Structurlam’s head office in Penticton, B.C. Structurlam’s current owners, the Kingfish Group, purchased the company in December 2018. Last fall they expanded once again, opening a third manufacturing facility a stone’s throw from the current one in Okanagan Falls. The new facility has the latest in CNC machining. CFI toured Structurlam’s facilities shortly after the new opening to learn how this mass timber leader turns 2x6s into beautiful pre-fabricated masterpieces. Structurlam is more comparable to an auto manufacturer than a wood panels producer, explains Stephen Tolnai, vice-president of sales and marketing. “We are not a typical manufacturer. We are custom, so our buildings are completely designed down to the individual screw connections before we make anything. That’s a critical part of it,” he says. All of Structurlam’s projects begin in the company’s CADD (computer-aided design and drafting) studio. There, drafters transform architect or engineer specifications into 3D models to execute the manufacturing process. A host of robotic machines then glue, join and press the wood, and cut the panels or beams to size. Some final components are added by hand. The finished structure is assembled on site and integrated with electrical, plumbing penetrations, and so on. “We don’t just make lumber, we don’t just make a CLT panel. We design, engineer and fabricate a structure one at a time,” Tolnai says. All wood is purchased at commodity prices directly from North American sawmills in typical lumber species and sizes. Structurlam then checks the wood for moisture content and strength before it is turned into mass timber products. “We buy our wood at a pretty consistent 15 per cent moisture content, lower than lumber, so we have to make special arrangements with the mills to kiln it to what we need. If it’s outside of that we sticker it and condition it naturally until it’s ready for our process,” Wentzel says. 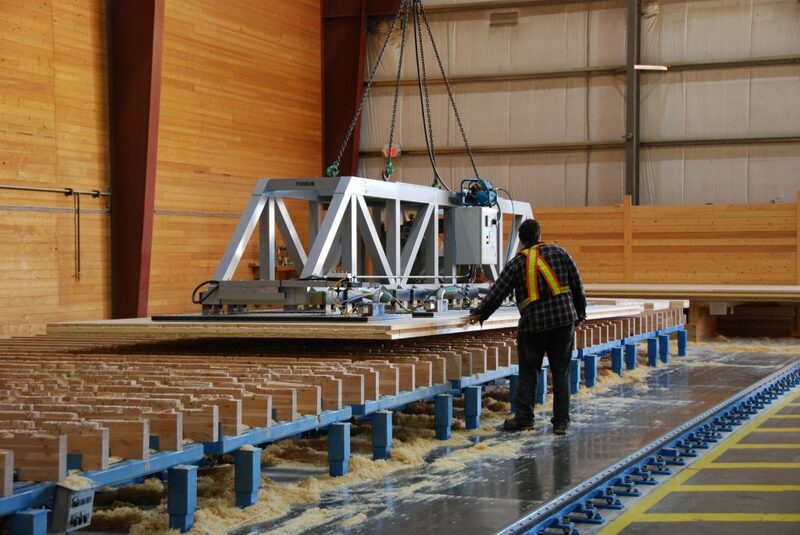 At the original Maple Street CLT facility in Okanagan Falls, the glulam and CLT process begins with a Metriguard 2350 transverse Sonic Lumber Grader, or e-rater, that measures modulus of elasticity for machine stress rated lumber. 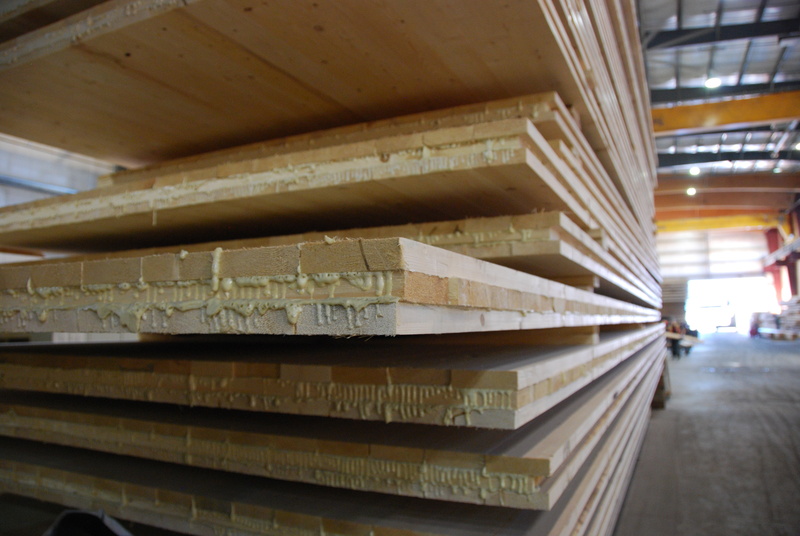 Depending on the product, lumber can flow to one of two COE finger jointers, or is sent directly to the CLT press, which applies layers of glue to cross-laid lumber boards and sufficient pressure to create the panel. 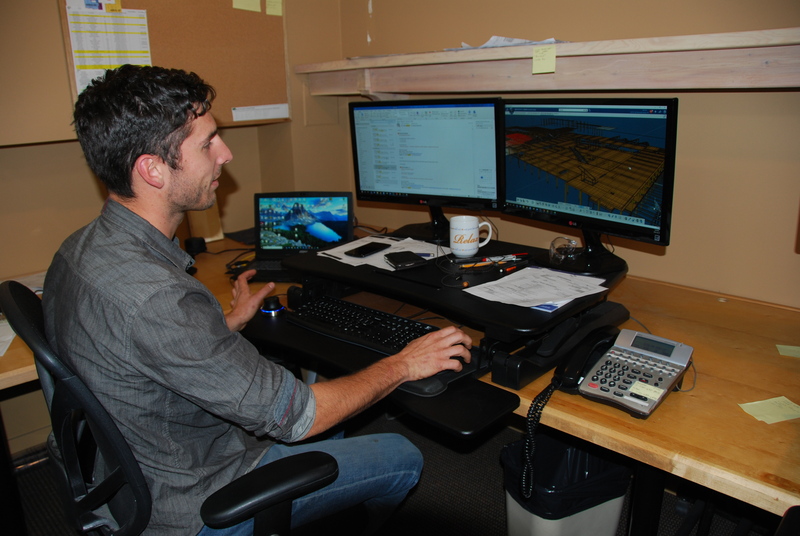 Sascha Engel works in Structurlam’s CADD studio at the head office in Penticton, B.C. Both CLT panels and the glulam beams can then be machined by the Hundegger PBA (panel processing centre) or Creno 5 axis gantry CNC that automatically cuts and drills with a variety of tools based on inputted CAD designs. Minda suction systems and Mussell Crane MFG overhead cranes allow the operators to move the heavy panels into place for the PBA machining. The Hundegger itself moves on a track over the panel. At the newest facility on Wallis Road in Okanagan Falls is a brand-new Hundegger PBA 5 axis gantry CNC, same model as their first only five years newer and with a host of new features such as an automatic tool changer. Rather than using a suction system to move the heavy glued panels, the new facility has a roller conveyor to move panels through the PBA process. The new facility also features a dust collection system from Edmonton’s VETS Group, and a biomass heating system from COBB that burns residuals from the manufacturing process. Structurlam’s main office and production facility in Penticton houses a Hundegger K2 3 axis CNC machine, as well as a Creno 5 axis gantry CNC. Europeans began developing CLT in the mid-90s. Structurlam took advantage of years of product development, and in 2011 adapted it for the North American market. In 2011, with funding support from the provincial government, Structurlam opened North America’s first CLT plant and began manufacturing its trademark Crosslam CLT. “Our building-with-wood culture is way more advanced in North America than it is in Europe. They build in masonry and concrete. Nearly every family residence in this country is stick framed, built on site by carpenters. We needed to make a lot of adaptations to the European CLT product development,” Wentzel says. In order to meet North American fire-testing standards, several adhesive manufacturers developed a new glue recipe that wouldn’t delaminate under heat. After many more tests, as well as manufacturing standards monitored by the APA Engineered Wood Association, wood-frame construction up to six storeys was added to Canada’s building code in 2015. The next version of the code, due out in 2020, is expected to allow for even taller wood buildings up to 12 storeys. Structurlam made headlines in 2017 as a supplier of the mass timber CLT and glulam used to build the University of British Columbia’s Brock Commons, the world’s tallest mass timber hybrid building at 18 storeys. Between 85 and 90 per cent of Structurlam’s business is non-residential, heavy industry and commercial. Other notable projects in Canada include the waterfront Vancouver Convention Centre, the Wood Innovation and Design Centre in Prince George, B.C., the Shane Holmes YMCA at Rocky Ridge in Calgary, and the Art Gallery of Ontario. During CFI’s tour of the finishing facility, employees were hammering in custom steel connections into dozens of massive glulam beams destined for Microsoft’s new headquarters in Mountain View, Calif.
Around 225 people are employed at Structurlam’s four manufacturing facilities and the head office. Depending on what products are going through, the facilities will run 24/7, 365 days a year. Last year was a record sales year for the company, and they expect to continue breaking records now that their newest PBA CNC machine is up and running. “We needed that machine to be running on Oct. 15. It was a huge bottleneck. And on Oct. 15 is was fabricating panels,” Wentzel says. Timing was essential. Interest in mass timber construction is growing at a faster rate than anticipated, Wentzel says. He expects CLT to well surpass the market adoption rate of similar engineered lumber products like I-joists and laminated veneer lumber, which took between 20 and 30 years to become standard construction material. “Why? Our building-with-wood culture in North America. Everybody is talking about mass timber. There have been several high-profile projects, and high profile developers are starting to adopt it. When they do that, you know the value proposition is resonating with people. It’s cost effective, it’s fast, it’s quality, and it’s sustainable. When all those buttons are pushed it’s quite exciting,” Wentzel says. The key for this CEO is keeping on track, or “sticking to our knitting,” as Wentzel puts it. “We need to keep the company upfront and growth is going to do that,” he says. And the projects keep rolling in. 1 Pings/Trackbacks for "Leading the masses: Structurlam expands Okanagan mass timber operation"